Praised as a "rare combination of approachable and unusual," by the NYC Jazz Record, New York based brass quartet, The Westerlies will be coming to Luther College as part of the Center Stage Series. This event will take place in the Main Hall of the Center for Faith and Life at 7:30 p.m. on Friday, Feb. 15. Tickets are $28 for adults, $26 for seniors 65+ and $15 for youth ages 4-18. Dinner will also be available at 5:30 p.m. before the performance in Peace Dining Room. Tickets for dinner are $20 per person. Tickets may be purchased online at http://www.tickets.luther.edu, or via the Ticket Office at (563) 387-1357 or tickets@luther.edu. Ticket Office hours are Monday, Wednesday and Friday 9 a.m.-10:30 a.m. and 11 a.m.-3 p.m.; Tuesday 9 a.m.-3 p.m.; Thursday 9 a.m.-7 p.m. 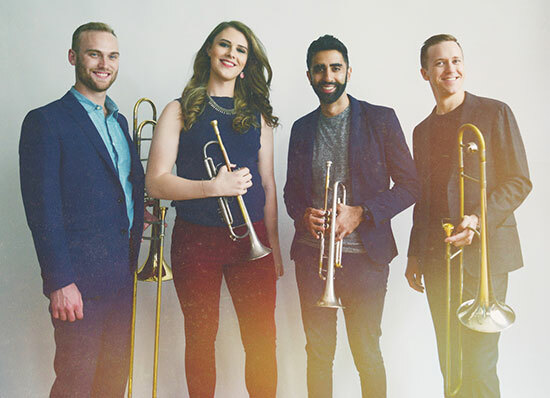 The Westerlies is comprised of a group of childhood friends from Seattle, Washington. Forming in 2011, they are self-described as an "accidental brass quartet," comprised of two trumpet and two trombone players. They explore influences such as jazz, roots and chamber music to create music that has been called "folk-like and composerly, lovely and intellectually rigorous” by NPR music. The Westerlies have produced two critically acclaimed albums of chamber music. Their debut album, "Wish the Children Would Come on Home: The Music of Wayne Horvitz," was released in 2014 and their latest, a self-titled double CD album of primarily original compositions, was released in 2016. The quartet is also featured on recordings by Fleet Foxes, Vieux Farka Touré, Common and Dave Douglas. They are currently working on a collaboration with the Grammy-nominated vocalist and composer Theo Bleckmann. Luther's Student Outreach program will be incorporated into The Westerlies time in Decorah as the group will hold a masterclass for Luther students and will visit the Decorah High School to engage with members of the Decorah High School band. Educational and community engagement are core elements in The Westerlies' mission. During each season, they reach out to thousands of students around the country with innovative and inspiring assemblies and masterclasses. Upcoming Center Stage Series events include Goitse on March 14, 2019 and Evolution on April 6, 2019. For the full Center Stage Series listing see https://tinyurl.com/css201819.